Katie from Swim, Bike, Quilt is a wonderful quilter who donates a large portion of her talents and time to making charity quilts. Katie and other quilters around the world support many of the charities providing joy and comfort in the form of quilts – Margaret’s Hope Chest, Bumble Beans Basics,do.Good Stitches, Project Linus, the work done by Sarah and her Quilt Ministry, andSiblings Together, women’s shelters, hospitals, disaster relief, Childhood Kidney Support Group, just to mention a few. Visit these sites for more information and see all the wonderful quilts being made and donated. Here are some ideas for easy children’s quilts. 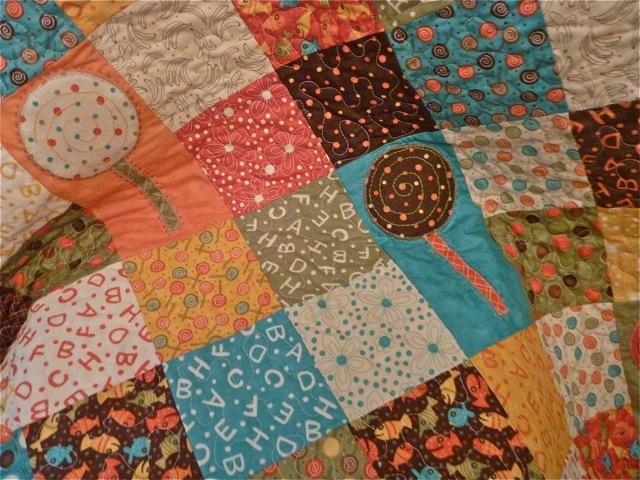 The lollipop quilt. 5″ charms, with appliqué lollipops. Pattern found here. Panels are fun too and all you need is a border and some fancy quilting and voila. 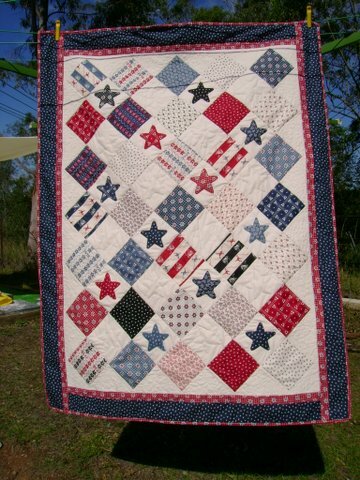 So get together with a group of quilting friends and make a fun day of making some quilts for a child in need. Your gift will be well loved and cherished. thank you, Jane. Beautiful quilts. Great quick quilt ideas! Some of these could be constructed in a weekend, I think.